The world has come together to adopt the new UN Sustainable Development Goals – and for the first time in history, we can say we may be the generation to finally end world hunger. When it comes to the future of food security, South-East Asia will play an important role. The region has made meaningful gains in reducing chronic hunger and malnutrition over the past few decades, and continues to be a food basket, and one of the most productive agricultural economies in the world. Home to more than 600 million people, the region of ASEAN (which stands for Association for Southeast Asian Nations) is expected to see food demand increase by as much as 40% by 2050. Regional integration is projected to increase South-East Asia’s exports by 15% and create up to 4.5 million new agriculture jobs by 2025. Yet challenges threaten these gains, including rising demand, diversifying diets, scarcity of land and water, and the impact of climate volatility on all major food producing areas. How can ASEAN transform its agriculture? Is the answer to this question increased investment, knowledge-transfer and innovation, financial inclusion and market access for farmers, improved policies, and better infrastructure? The answer is yes, all of the above. But at the heart of the solution is partnership – a new type of partnership, in which leaders from governments, companies, farmer organizations, academia and civil society can sit together and share their concerns, define goals and plans, and look to one another as equal partners in improving the system together. Having recently committed to a formal economic community, ASEAN provides prime conditions for cooperation and partnership on food security. The World Economic Forum, in collaboration with the ASEAN Secretariat, launched the Grow Asia partnership in 2015, to enable such collaboration and action. Grow Asia is a partnership between various parties and sectors, committed to reaching 10 million smallholder farmers by 2020, helping them access knowledge, technology, finance and markets; and working to increase their productivity, profitability and environmental sustainability – the target is to do so by 20%. In Indonesia, companies, government and NGOs are working together with corn farmers to improve their productivity and profitability by bundling services such as microfinance, crop insurance, digital payments, financial literacy and markets. Each actor contributes their expertise –and yields benefits from the improved value chain as a result. The farmer sees crops yielding greater profit (without using more land or water) and is able to provide food for the family; meanwhile the companies have a higher-quality product and more inclusive supply chains. Government and NGOs, too, are positively affected. In Vietnam, coffee farmers have seen productivity rise by over 30% and net incomes by 14%. They have almost halved their carbon footprint, reducing water usage by 40%. This is all a result of innovative collaboration among 30 partners from government and civil society, as well as a range of corporations representing fertilizer, crop protection, roasters and exporters. The unique coalition has had a lasting effect on Vietnam’s coffee value chain and the model has now been instituted as the basis for a new national sustainability curriculum, which will be made available throughout the country’s agricultural extension service. Grow Asia offers an example of a new model for collaboration in agriculture already being implemented by five countries in ASEAN. It was inspired by a similar partnership, called Grow Africa, which was co-founded by the Forum, African Union Commission and NEPAD Agency in 2011, and which now supports 10 million African smallholder farmers in 12 countries through $2.3 billion worth of investment. In the state of Maharashtra, India, this partnership model has defined a target of reaching 2.5 million farmers by 2020. The Government of Maharashtra works together with smallholder farmers, companies and civil society to provide training and tools, financial services and procurement channels for crop value chains that will improve food security, environmental sustainability and economic opportunity. They have inspired 3 more States to adopt the approach. The World Economic Forum’s New Vision for Agriculture initiative is supporting leaders in 19 countries across Asia, Africa and Latin America to develop these innovative country-owned partnerships. A new guide to country-led action has been developed to share the experiences of these pioneering countries with leaders around the world, so they can adapt them to local needs in line with the Sustainable Development Goals. 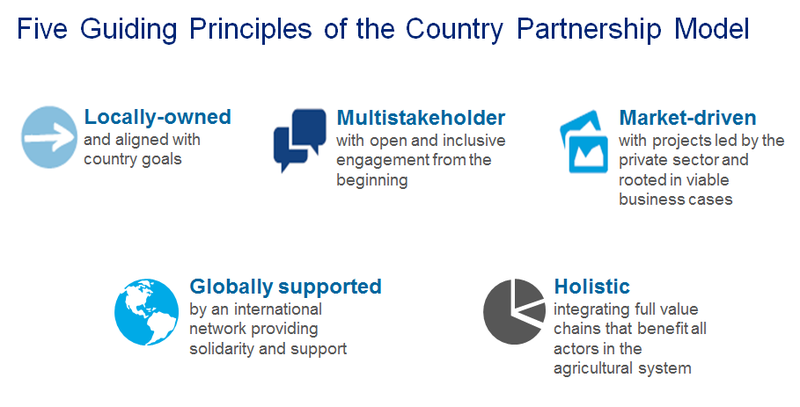 Below are the guiding principles and step-by-step framework for action to build and strengthen effective partnership approaches in agriculture. Leaders of state and business will gather for the World Economic Forum on ASEAN in Kuala Lumpur this week. There they will be showcasing impact from Grow Asia partner countries, featuring innovative solutions for sustainable growth in the agricultural sector, and working together to plot a way forward. As ASEAN starts a new chapter of regional cooperation, it’s these new models of partnership that offer the best promise for shaping a food-secure future and eliminating hunger altogether. Please see more information on the Grow Asia partnership and the World Economic Forum’s Food Security and Agriculture initiatives. The World Economic Forum on ASEAN is taking place in Kuala Lumpur, Malaysia, from 1-3 June. This article also appeared on The Jakarta Globe. Q&A: How are partnerships changing Asia's food systems?